By unofficial count, at least 50,000 people have died since 2006 when Felipe Calderon deployed the military against the drug cartels in his first days as president. But the number of deaths today is undoubtedly much higher. While drug-related deaths continue to escalate as the Mexican drug war wages on, Mexican youth have resorted to peaceful and artistic forms of protest against the violence. Last Sunday, activists met on Mexico City’s Zocalo Square in an effort to demonstrate against the war. They covered the public space with chalk outlines of human bodies. The bodies were supposed to represent all the lives that have been lost during the war against drugs in Mexico. While Mexico City has not been as severely impacted by the drug-war as the northern region of the country, the peaceful demonstration still resonate with many in the capital city. “We were supposed to draw sixty thousand bodies,” said Mexico City resident Gisela Saveedra, who heard about the event on Twitter. “But [sixty thousand] wouldn’t fit in the Zocalo, we would need three Zocalos for that,” she estimated. But this is not the first time Mexicans turn to art to protest against war on drugs.In 2010 Christian youth groups in Ciudad Juarez began dressing as angels and bringing messages of love directly to the drug traffickers and killers. Their aim is to save their city and fellow citizens through a message of peace and love in the face of violence and hate. A local Spanish-language newspaper, El Diario, recently reported a notable decrease in murders between January 2011 and January 2012. They reported that there were only 117 homicides in January 2012 compared to 222 homicides in January 2011. 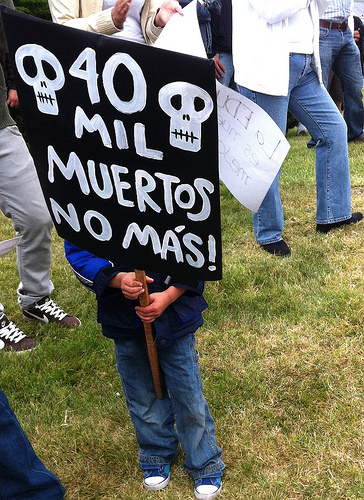 Whether this decrease in murder cases is related to Mexico’s peaceful protests is up for debate.